The newly updated Humanscale M8.1 Dual Monitor Arm is your go-to ergonomic accessory to bring you into a new era of dual-screen viewing. The system comes with a dual-monitor crossbar that has a 24-lb weight capacity (12 lb for each monitor), all mounted on a single post. Your monitors' height and depth adjusts together, providing you viewing comfort and stability with one surprisingly simple accessory. Monitor size Max monitor size is 24"
The Humanscale M8.1 Dual Monitor Arm is designed to mount to a multitude of surfaces. Clamp, bolt-through, slatwall, direct wall mount, Frame One mount, and c:scape mount are available. A combination clamp and bolt-through mount is also available. The Humanscale M8.1 Dual Monitor Arm is available in your choice of three finishes: polished aluminum with white trim, silver with gray trim, or black with black trim. 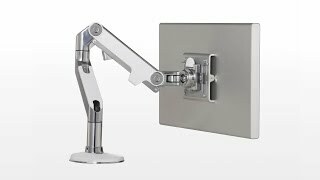 The Humanscale M8.1 Dual Monitor Arm is customizable with a wide variety of arm styles. The different link components are outlined below. The Humanscale M8.1 Dual Monitor Arm comes with a crossbar which allows you to connect two monitors, side-by-side. Order the crossbar with a handle, which will extend below your monitors and provide you with easier adjustment. Your monitor will attach directly to the Humanscale M8.1 Dual Monitor Arm with a VESA plate adapter. Most monitors come with a standard 100 mm x 100 mm VESA adapter, but larger or older monitors may have different sizes. Please check with your monitor's manufacturer if you are unsure what size plate your display requires. On the plus side, this beats having two separate monitors sitting on the desk top hands down. The arm is a little stiffer to operate than I would like, the pivots on the arm are just not smooth. Perhaps disassembling and using some teflon tool lubricant would do the trick, but that's more effort for something that shouldn't be an issue. My biggest complaint is that the two monitors, which I have keystoned, do not easily stay aligned with each other when I move the arm from one position to another. I have a sitting and treadmill position on this desk, and getting everything set just right takes far more effort than is should. There should be some mechanism to bind the two monitors together, like velcro strips with pressure sensitive adhesive. I consider this aspect a significant design flaw. $599.00 List Price: $644.00* The list price is the same as the MSRP (Manufacturer's Suggested Retail Price). It may not necessarily be the price at which the product is sold.